In Shopper Marketing, it's all too easy to forget that the person you're communicating to may not be the actual Consumer of the product. Shoppers are focused on the 'buying process' and Marketing to them is all about making it easier for them to buy. It demands an approach that's entirely different to traditional consumer oriented communications, with their focus on awareness and benefit-led performance. To influence purchase decisions at the vital time - close to the point-of-sale - Shopper Marketing needs a holistic, accurate understanding of how Shoppers behave throughout the purchase journey. With this, it becomes possible to identify the most influential touchpoints, optimise messaging according to its role and place in the purchase journey, and implement appealing rewards/incentives to close the sale. The challenge: How to obtain that insight and leverage this to benefit Brands, Shoppers and Retailers. 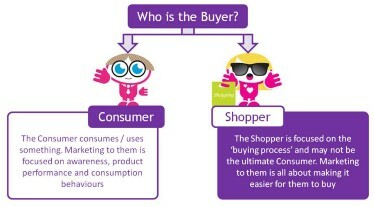 Highly effective Shopper Marketing campaigns can be created by applying 'shopper-centric thinking' to overcome the barriers and activate purchase by engaging, delighting and motivating the Shopper. smp achieve its results through a new level of insight gained from it's proprietary tools and methodologies, which gives them a greater ability to help brands deliver category value to retailers.